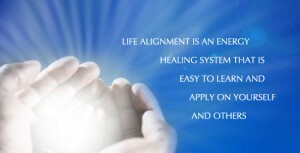 Life Alignment is a form of energy healing. It uses light touch to access a system of points on the body, combined with energy balancing, and emotional processing or guided introspection. These techniques are applied to align the client with his or her higher self or innate knowing, and to align the subtle bodies with one another and with the physical body. So the technique is an energetic operating system that can be used for personal growth, self-transformation and spiritual enquiry through a process of self-exploration and investigation. Effects on the physical body can vary between “miraculous” and indiscernible. Life Alignment works on the subtle energies rather than on the physical body itself. It incorporates dowsing, muscle testing, the use of vortex cards, tools for working with geopathic stress, and for working with organisations, businesses and homes. It was developed by Jeff Levin, and began as Body Alignment Technique in the 1980’s. When the vortex cards were developed, the system was expanded and became Life Alignment Technique. There is a network of practitioners across South Africa. A typical session lasts for between one and two hours, and is conducted fully clothed on a massage table. Each session stands alone. Although a series of treatments can be very helpful, it is usually not necessary to commit to more than one session at a time.